Hello everyone! 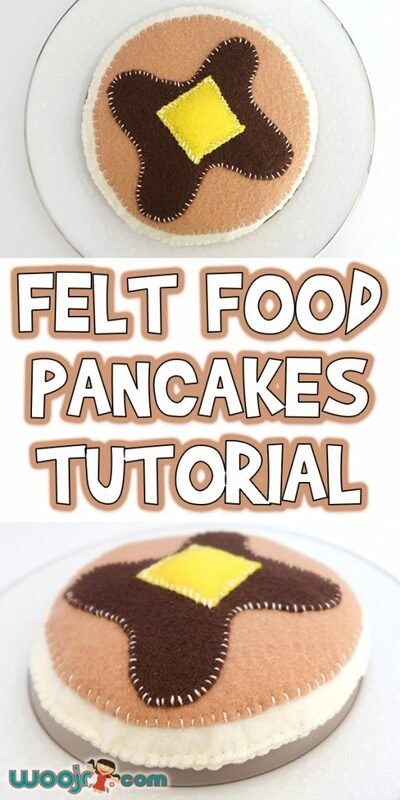 To continue with our felt food series, today I’m sharing this Felt Food Pancakes Tutorial. 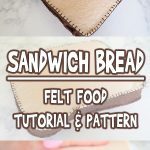 This is another one that doesn’t need a pattern, but is really easy to sew. 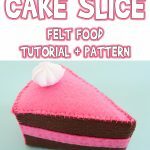 My toddler absolutely loved his felt food pancake when I added it to his collection, and took a “bite” out of it right away! Here’s what you’ll need! 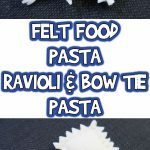 Check out all of our felt food patterns while you’re here! 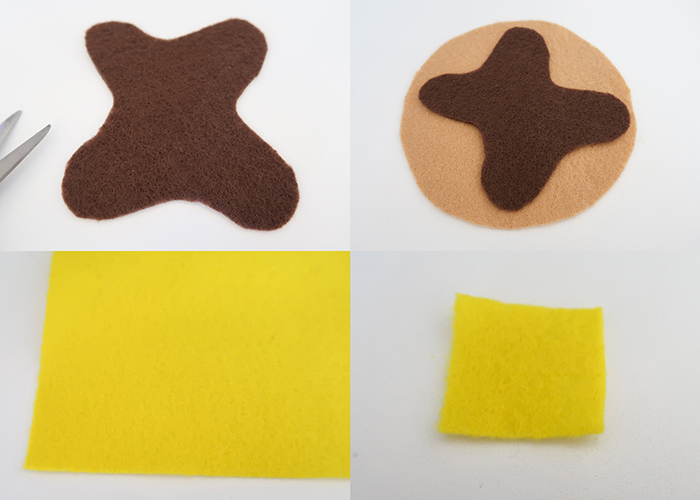 Cream, tan, yellow, and brown felt. An old cd or other round object to trace. 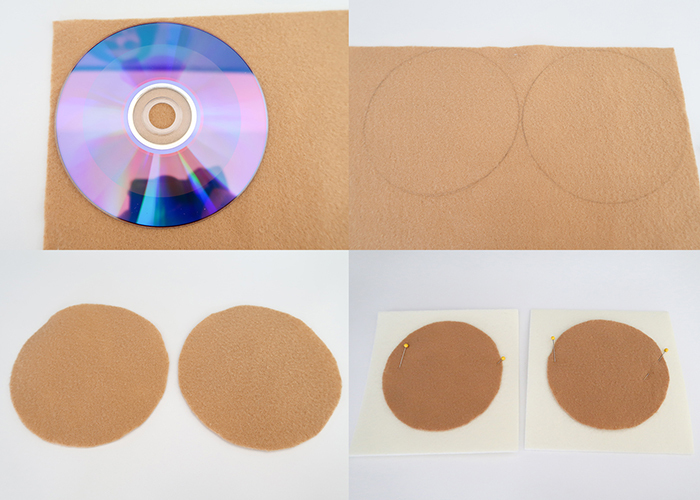 Start by taking your tan felt and use your cd or other round object to trace two circles on it. Cut those out. 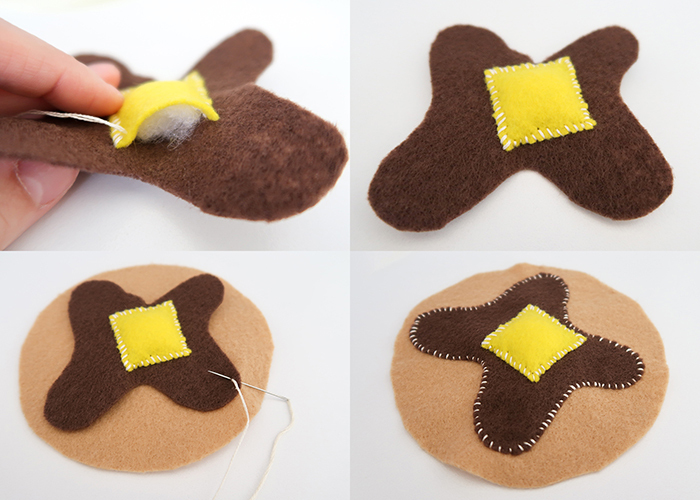 Now set those circles on top of your cream felt, and pin them in place. Using a ruler, mark 1/2 inch all the way around the outside of your tan circles like shown. 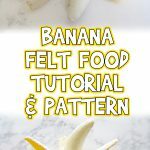 This gives you a guide to follow. Cut along the guide so the cream felt is cut in a circle 1/2 inch wider than the tan felt. Remove the pins and separate the pieces. 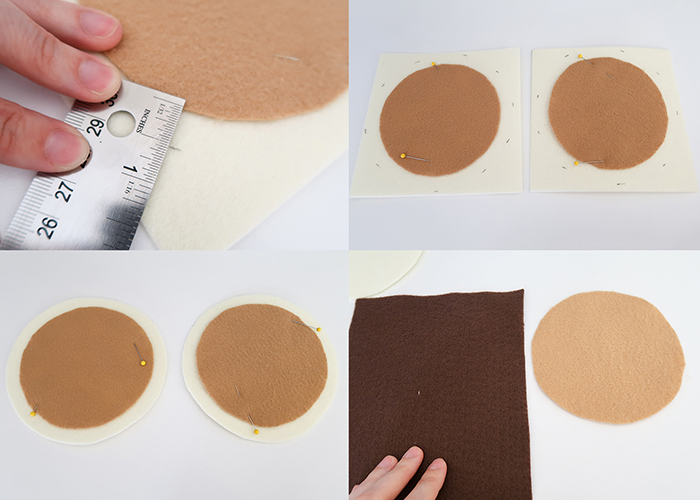 Take your brown felt and hold it next to one of the tan circles to estimate the size. And then cut out some squiggly syrup. It should fit just inside of the tan circle like shown. 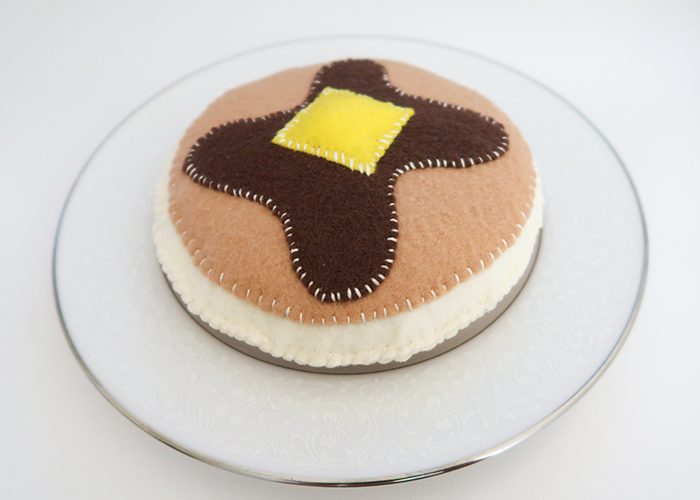 Now take your yellow felt and cut out a square for your butter. The butter piece should fit just inside of the syrup, so it should all stack together nicely. Now thread an embroidery needle with your cream embroidery thread. 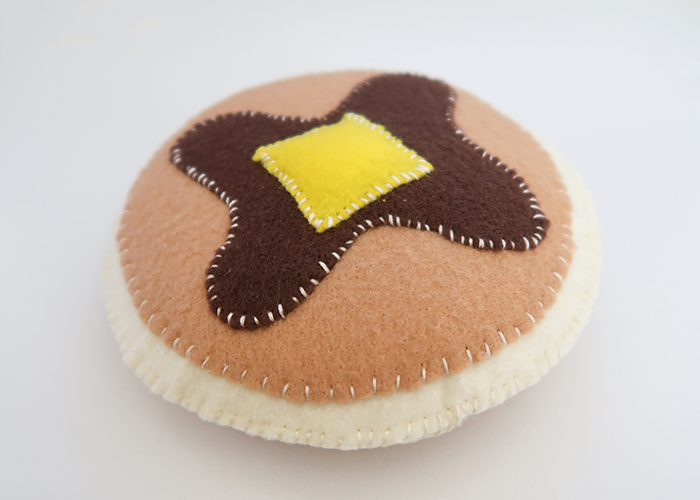 I used cream thread for the whole pancake for fast sewing, but you can match colors more exactly if you’d prefer. 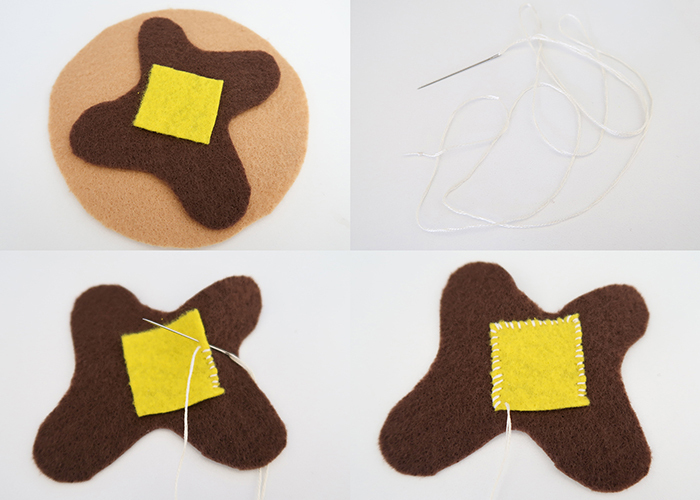 Start by sewing your butter square onto your syrup piece, leaving one side unsewn. Stuff your butter with a small amount of fiber fill, and then sew the last side closed. Now take the syrup and butter piece and set it on top of the tan circle, and sew the syrup down into place. 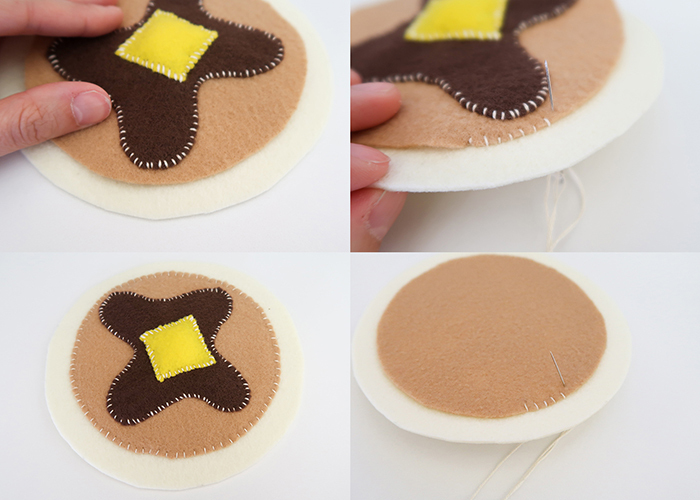 Next, you’re going to set the tan circle on top of the cream circle, and sew it down into place as well. The top of your pancake is all done, so set it aside. 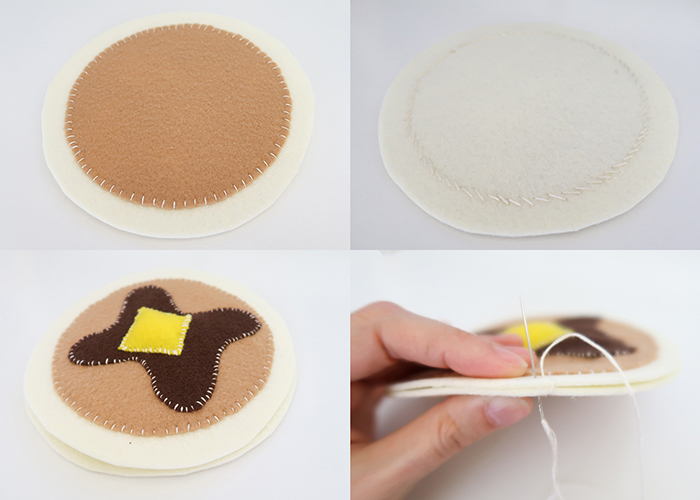 Now sew together your other set of tan and cream circles to make the bottom of the pancake. Take this piece and turn it right side down like shown, and place the top of your pancake on top. 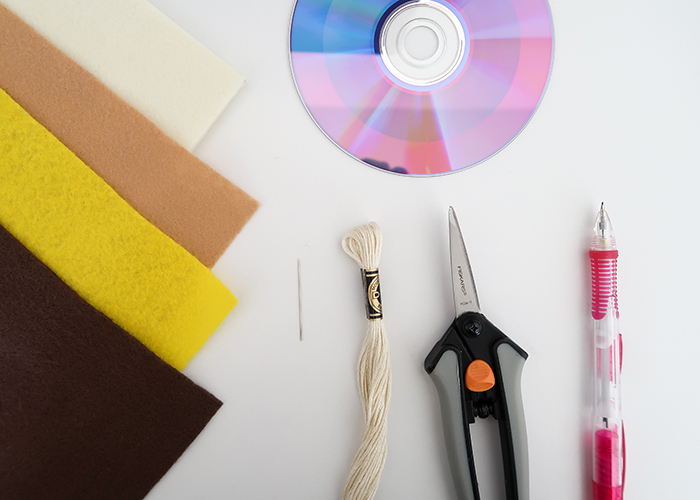 The edges will most likely not be even, so take your scissors and trim around evenly in a circle to make the edges even. Now start sewing the two halves of the pancake together. Leave about a 1 1/2 inch gap open, and fill your pancake with fiber fill. You want it full, but not so much that it loses it’s flattish shape. 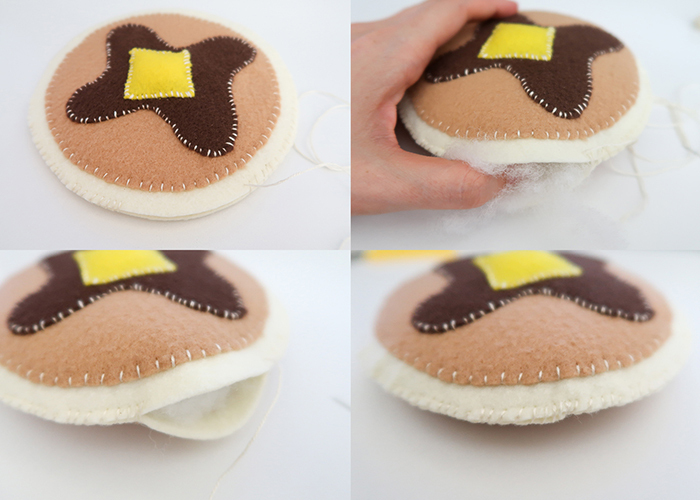 Now continue sewing the rest of the way around your pancake. And you’re all done! 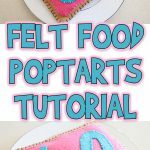 You can make a whole bunch of these! You can even make a stack of pancakes by making one with the butter and syrup on top, and two more just plain. 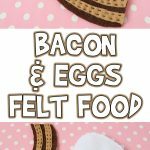 I hope your found this Felt Food Pancakes Tutorial helpful, and have fun making these for your kids!